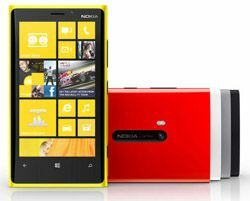 Nokia launches flagship Lumia 920 with Windows Phone 8 | What Hi-Fi? Nokia has launched its brand new flagship smartphone, the Lumia 920. Announced by Nokia alongside Microsoft in New York, the Lumia 920 uses the Windows Phone 8 operating system and sports a 4.5in display. With rumours continuing that Microsoft could buy Nokia, the Lumia 920 is seen by many analysts as a last throw of the device. And reaction was mixed: Nokia's share price fell nearly 15% after the Nokia press conference. The new Nokia Lumia 920 has a 1280 x 768 resolution on a 4.5in IPS LCD screen, with Nokia claiming its PureMotion technology makes for "the best touchscreen ever seen on a smartphone" and the "fastest LCD screen" on a mobile phone. Once more, Nokia is pushing its camera technology – made famous by the 808 PureView and its 41mp camera – with the Lumia 920 sporting a 8.7-megapixel PureView camera with a Carl Zeiss lens. There's a dual-core 1.5Ghz Snapdragon S4 processor, which doesn't quite get the pulse racing with quad-core phones now commonplace. More interesting is the support for wireless charging, but you'll need to buy your own wireless charging pad – like Nokia's, for example – to get started with that. There's Nokia Music and Nokia Radio music services for streaming music, Bluetooth 3.1 for wireless music and a 32GB hard disk for storing content, though no sign of an SD card input. There is however a removable battery, though the 2000 mAh claims around 67 hours of music playback and 7 hours of video. The flagship status of the Nokia Lumia 920 suggests it could retail for as much as £500 without a contract.